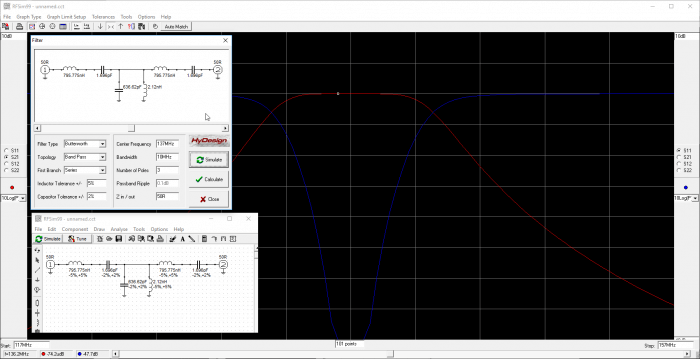 RFSim99 is an old but still very useful piece of free software for designing and simulating RF circuits such as filters, attenuators, matching circuits, RF components with S-parameters and so on. It is not a high end tool, but is more than good enough for hobbyist and ham level designs. One issue up until recently with RFSim99 was that it was so old that it would only run on Windows XP computers. To run on a modern PC you needed to use a virtual machine, or the Windows built in XP emulation, which was only available on Professional/Ultimate Windows versions and has since been discontinued in Windows 10. However, we have just found AD5GG's blog where earlier in the year he posted a standalone version that actually works in modern Windows versions (7, 8, 10) without the need for any virtual machines. RFSim99 is fairly simple to learn. Just place down two measurement ports (in/out) and lay down your RF components on the grid. Then connect them up with a wire and place grounds. Click on the simulate button to see a graph of the response and return loss. There are even built in calculators in the Tools menu which can automatically design and simulate filters for you. I don’t know what you know about elementary usage of PC but one thing is very clear: you must learn much much more about PC. After reading your post i’ve just launced the RFSim99, from a backup from 2006, on my Windows 8.1 which was installed on other PC and works just fine. I mean i.ve moved the HDD from a PC to another and both work very well. If you actually read the linked article you’ll see “The RFSim99 installer package stopped working after Windows XP”. The core issue with RFSim99 is that the installer does not work on operating systems > Windows XP. If you copy the installed files from another location, or run the installed files from another drive, they’ll likely run no problems, even on OS’s > Windows XP. You don’t understand. I’ve installed on Win 8.1 from an installer made in 2006 and works very well and this Win 8.1 was installed on actual HDD and partition when the HDD was in other PC. I just moved HDD with all content in a new PC and works without installing again. In this conditions RFSim99 from 2006 installer, when the latest was XP, works without problems in Win 8.1.
rfsim99 also works nicely on linux thanks to wine. I have used it expensively on on linux and windows.